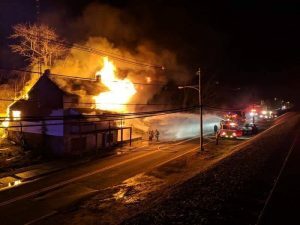 This morning just after 3 am, the company was alerted to assist the Water Witch Fire Company in Port Deposit on a house fire at 240 North Main Street. Engine 16 and Truck 6 responded. The fire was discovered by the homeowner. Upon the arrival of the first units, the fire was well advanced, and being driven by 25 MPH winds. The cause is being investigated by the Office of the Maryland State Fire Marshal, preliminary investigation lists the fire as accidental.